Say goodbye to Android as you know it. Ice Cream Sandwich (otherwise known as Android 4.0) is coming, and it’s the biggest upgrade Android has seen to date. But fancy new software isn’t the only thing Google’s been working on: they’ve also just announced their new flagship Android device, the Samsung-made Galaxy Nexus. I got to spend a solid chunk of time with both the new hardware and the new software, and have returned with a venerable mountain of first impressions, insight, and the best damned demo video you’ll find anywhere. As an army of now-unemployed webOS employees could tell you: without good hardware, good software is nothing. 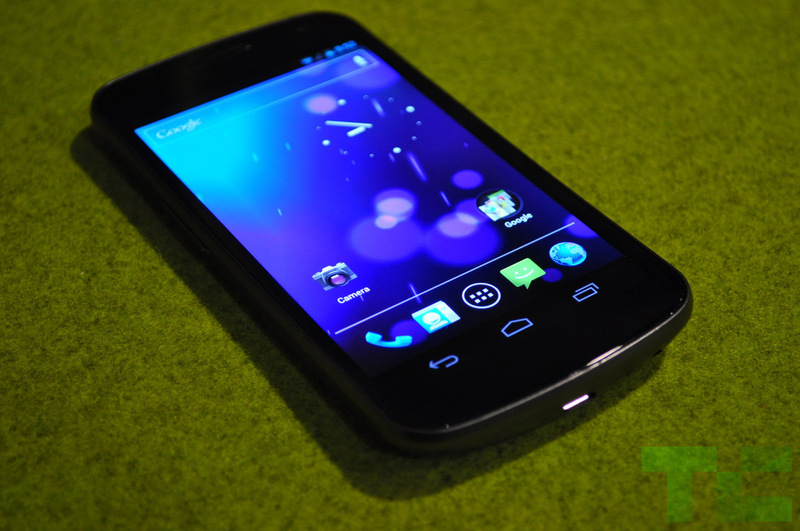 Fortunately, the Galaxy Nexus is — at least from what we’ve seen so far — good hardware. Really good. As in, quite possibly the best looking piece Samsung has ever built. Take the resoundingly solid design of the Galaxy S II, add the subtle curve of the Nexus S’ display, throw in some svelte curves for good measure — Ta-da! You have the Galaxy Nexus. 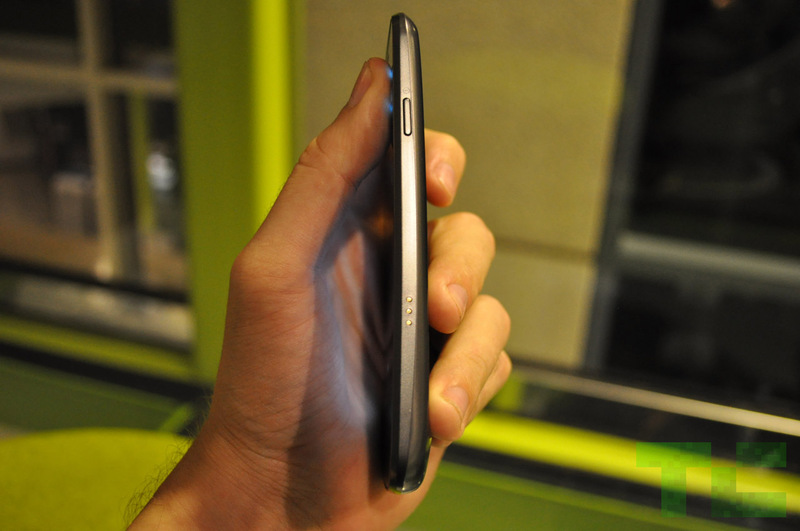 Appearing from the side as something not unlike a teardrop, the Galaxy Nexus tapers from above down into an ever-so-slightly thicker base. Unlike the “hump” found on the rump of the Motorola Droid X (or even the just announced Droid RAZR), however, Google tells me that the deeper base is designed as such for sake of ergonomics, rather than as a store-all for the device’s thickest components. Also unlike the Droid X, the Galaxy Nexus’ wider bit doesn’t detract from the device’s overall look. There was one bit of the body that I wasn’t a fan of, though: the battery cover. Like many a Samsung before it, the Galaxy Nexus’ battery cover is made up of a chintzy-feeling plastic. You wouldn’t notice until you pulled the cover off… but once you do, it just sort of sticks with you. My opinion may be swayed a bit after having seen the exceedingly slick Kevlar rear of the Droid RAZR this morning — though arguably, the RAZR’s rear panel isn’t removable. Samsung has been improving their Super AMOLED series of displays at a breakneck pace, and they didn’t ease off the gas for this one. With an HD resolution of 1280×720 (a first in the mobile world) and coming in at a mindblowing 4.65″, I couldn’t help but wonder: would the screen be too big? The answer is no. In most cases, it felt no larger than the now relatively commonplace 4.5″ screen. Why? It’s all about the buttons. Where previous devices might’ve put their capacitive hardware keys, the Galaxy Nexus puts more display. The buttons become a part of the screen itself, allowing the screen to appear to be a more comfortable 4.5″-or-so during regular use, expanding out to 4.65″ (by hiding the onscreen buttons) only when it’s most beneficial to the experience (like during video playback.) This on-screen button trickery is an optional offering of Ice Cream Sandwich, so expect other manufacturers to pick it up stat. Though I didn’t manage to finagle a sample shot to offer up as evidence, the quality of the device’s front and rear camera seemed about average. I tested the device in a relatively low-light room, and I was neither harshly disappointed nor overwhelmingly impressed. Ice Cream Sandwich is Android as it should be. It’s the first time I’ve used Android and felt that Google has stepped anywhere near that truly fine balance between power, flexibility, usability, and good ol’ fashion beauty. Android has always been powerful — it just never really looked all that good doing it. Ice Cream Sandwich looks good. Really good. Oddly, I never liked Honeycomb, the tablet-only predecessor from which Ice Cream Sandwich takes so many visual cues. Both Honeycomb and Ice Cream Sandwich share a generally dark motif. Stretched out across a tablet’s display, that darkness can come across as a depressing, empty void. On the smaller display (as weird as it is to classify a 4.65″ display as “smaller”) of a smartphone, however, it’s sharp. I’m also a sucker for symmetry, and the center-aligned icons of ICS on a phone (as opposed to the side-aligned icons on a Honeycomb tablet) just look better. The widgets system has been overhauled, with the primary new trick being resizability. The Gmail widget, for example, can be scaled to show just two recent e-mails at a time, or, with a brief hold of the widget and a quick drag of the edge markers, up to three or four. You can, at long last, take screenshots right on the device. Outside of a few phones which had screenshot functionality hacked in by the manufacturers, nabbing a screen grab on Android generally entailed installing a massive SDK onto your computer and learning your way around the tools. The browser has been thoroughly improved. It’s got the usual bug fixes and performance enhancements, but also now allows you to save pages for offline reading and to request the non-mobile version of any page with just one click (presumably through a bit of user-agent trickery). The new camera is really, really fast. Shutter lag is non-existent, and it’s ready to take another picture in well under a second. I’m itching to do a quick-draw shoot out between the camera on the Galaxy Nexus and that of the iPhone 4S. The speech-to-text engine has been completely overhauled, and is remarkably fast. You speak naturally, and the streaming speech-to-text conversion should only lag behind your words by a few syllables. You’ve gotta see it to believe it (check it out in the video above at the 2:31 mark). Also well worth seeing (9:25 in the video above): the Face Recognition Lock. Android takes a few seconds to analyze the structure of your face — once configured, your mug is the only one that the device will unlock for. In low light situations (wherein the camera might not be able to see you well enough) you can fall back to a swipe pattern (which ICS requires you set up while configuring the face detection). To create a folder, you now simply drag one app on-top of another. Apps can also now be dragged in and out of the static dock area without trudging through settings. They’ve tucked in a rather talented photo editing tool, with everything from scaling/cropping to basic photo filters. 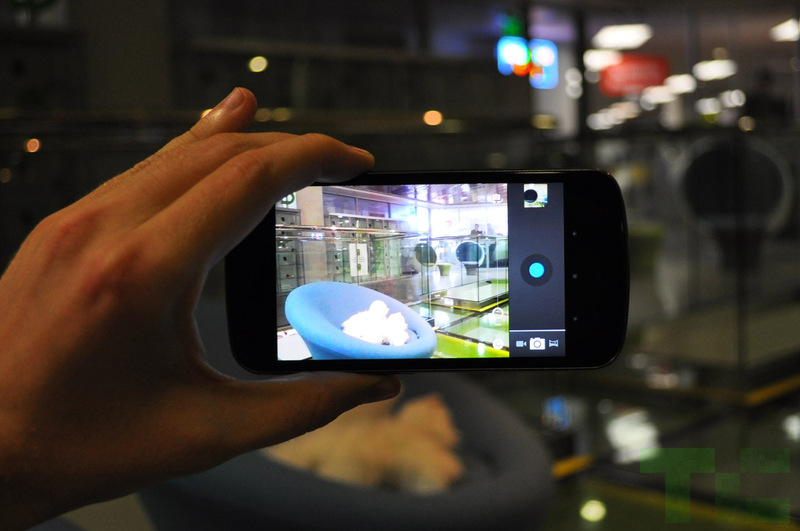 It’s no Photoshop, but it’ll probably hold you over until Instagram makes its way to Android. To geek out for a moment, there was one small bit that was perhaps my favorite of all: the data usage monitor. With the quick drag of a few sliders across a graph, you can quickly peruse a timeline of your data usage, and narrow down which apps are the data-gobbling culprits. One more bar lets you set up automatic warning triggers for your data usage, while a final bar lets you set a point (say, half a meg shy of your monthly cap) at which your data connectivity automatically offs itself. As someone who gets nailed for data overages pretty much each and every month, I love it. Ice Cream Sandwich is pretty. It’s polished. It’s animated, and shiny, and jam-friggin’-packed with gradients and alpha translucencies. What it’s not — at least not yet — is flawless. There was a crash here and there, and a tense moment or two when a slider just… wouldn’t.. work. Google was quick to note that the build I was seeing was a relatively old one — but even if it weren’t, they still have weeks to stomp out the lingering bugs for the initial release, and months before anyone really expects Ice Cream Sandwich to trickle out onto a wide array of devices. They’ll fix it up right.